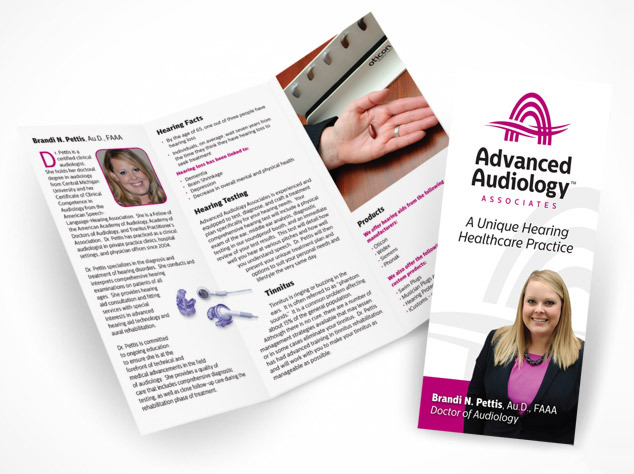 Visual Lure recently completed this new logo and identity package for Advanced Audiology Associates, a new audiology practice opening soon in St. Louis, Missouri. The new logo features two types of audio waves that create the St. Louis Arch and the Mississippi River. They also create three letter A’s for Advanced Audiology Associates. We think that’s pretty clever and memorable; please like or share this post if you agree. The typeface is Centrale Sans Condensed with custom letter A’s designed to complement the logo mark. Below you can see the new logo in both horizontal and vertical applications, underneath that are additional color variations and at the bottom is the identity package – which includes the company business card, letterhead and envelope design. Almost all the logos we design are heavily concept-driven because we feel logos with meaning tend to be more memorable. If you want a logo that people and customers will remember, one that stands the test of time, and catches people eyes, give Visual Lure a call today.